Everyone, meet Celishia. Whenever I felt anxious about moving to Chicago, I’d think about how my new city would bring more hang time with Celishia and another mutual friend of ours and feel more calm. It really has been lovely to spend time with her here (especially in the beautiful new home that she mentions toward the end of this post! ), and I’m so happy she decided to participate in this series. C: I turned 28 in December of 2009. I was in Matteson, IL, a suburb outside of Chicago, living at home with my mom. I had just started a new job a little over a month before my 28th birthday, as a counselor, my current job. Before that, I had been out of work since June when I finished grad school. That was the longest that I had been out of work in my adult life. It was kind of rough, identity-wise, because I’d always had a job and a place of my own. I was kind of moody on my birthday. C: A lot of things happened that year. In late March, I traveled to France to visit a friend who was researching for her dissertation. Soon after I returned, there was a break-in in my apartment and I had to make a decision on whether to stay or leave. My mother seemed to feel that I couldn’t stay in my apartment and being within a few months of graduation with no promise of a job, I didn’t feel comfortable moving to a new place. So it was decided that I’d move home. Sometime between the break-in and the move, I attended my five-year college reunion in St. Louis. I had a great time with my friends but felt awkward explaining that I was about to move back home. I also remember that after I graduated in June, I took my first “real” vacation to celebrate. It was a great summer – I did a lot of things for someone without a job. I went skydiving during my job search, and I remember thinking, if I can jump out of a plane, I can tackle this thing. In terms of world events, earlier that year there was the inauguration of Barack Obama. Michael Jackson died that year, which was huge. I remember watching the funeral on TV. And I remember that Chicago didn’t get to host the Olympics. I watched on TV thinking it would be this daylong thing and then we were out of the running really quickly. The majority of my reading that summer was focused on studying for the National Counselor Exam and reading job announcements. J: How were you feeling about having the graduate degree? C: I was really excited about it. I think I was the first person in my family to have a master’s degree. I had worked hard and accomplished my goal of a 4.0. I had done what I set out to do. When I graduated I was planning to move to DC and be near friends on the East Coast. So I was excited and I was proud, and I was hopeful about this new life and these new possibilities. I was really hopeful for change. J: You mentioned being moody on your birthday, though. So was there some sort of shift? C: Yeah. The shift, I think, happened as the job search continued…and continued…and continued. There were two jobs in DC for which I made it far along in the interview process. When those didn’t pan out, I was discouraged. But after I heard I didn’t get the second job, that’s the day I applied for the one I got here. At the time it was my dream job – ideal population, ideal location, ideal setting, free services for people from the population I wanted to serve. If you’d asked me six months earlier what I wanted to be doing, it was everything I would have described. But the pay wasn’t great, and I was living at home and most of my savings had run out, so while I had my dream job, other things weren’t exactly lining up. J: And what happened in the period after your birthday? C: I think my birthday mood was mostly related to friends and socializing, because work-wise, things were pretty good: I took my exam in November and got my license in December. However, it was also the first time that I was not in school. I worked full-time while completing my graduate degree and I took certification classes during my time as a teacher. In hindsight, that may have had something to do with my mood. I had lot of extra time but I wasn’t filling it with anything fun or exciting. Then, shortly after I turned 28, I reconnected with one of my best friends from high school and we made a vow to hang out more. We did all this single girly stuff, had sleepovers at her house on New Year’s and Valentine’s Day. In the year that followed, if there was some after-work event, some party, anything she was aware of, we were there. Lots of fun memories. Lots of free drinks. I felt really good about being able to go out and meet people, and enjoy the city. So 28 ended up being pretty good even though it started out weird socially. J: And at work, was there a specific thing, like a client relationship or feedback from a boss, that made it so positive? C: I’m thinking about different clients. Individual client progress I can’t articulate for reasons of confidentiality, but one in particular struggled with this sense of needing to put on a face or a mask. That’s a theme for a lot of my clients, but to work with her, empower her to acknowledge her feelings, whether anger, rage, sadness, [just to acknowledge that] she wasn’t always happy and be ok with that. That was really powerful. I think a lot of my pride in my work comes from creating a space for people where they don’t have to wear a mask, or that they can take pieces of it off even if they’re not really ready to fully reveal everything. Or I can provide an environment within our relationship so that they can feel or show things that they weren’t previously able to. J: Do you feel close to the memories from that year, or far from them? C: Wow. I’ve read that so many times and I’m like, I don’t know! In a way they feel far away – like they are much farther than two, almost three years away. My life feels so different now. But at the same time, they’re still really close and accessible. Some of it is muddled. I’ve always been really independent, so the three years I was at home are kind of jumbled together because I needed to get back to being on my own completely. J: When you spend time with your mom, do you feel closer to or farther from to that time? C: It’s only been six months since I moved out. I can feel a difference in terms of how we relate, and the sense that I’m back on my own. She knows it, I know it, and it just feels different. It may also be because I’ve since purchased my own home. I noticed that living at home illuminated childhood patterns that I was able to avoid or not acknowledge as much when I had my own place. Living with those again, learning to manage them as an adult as opposed to the way I handled them as a kid, was different. I don’t know how it’s different, but knowing that I’ve seen those patterns come up again and learning to handle them as an adult is grounding. I think my mom respects me more and knows how I handle things as an adult. It was helpful for us even if it was stressful in the process. J: Do you have any advice for someone going through this (supposedly) astrologically tumultuous time? Or do you just have advice for people turning 28? C: I’m trying not to be therapisty. But: hold on to what you know to be true and what it is that you want for yourself. Do things to remind you of who you are, of your strength. I think that’s what my skydiving was about. And it was important to me that I pulled the cord to open the parachute. My instructor told me that only 25% of people do so and I was the first of his students to do so that day. It reaffirmed my ability to take care of, to save, myself. 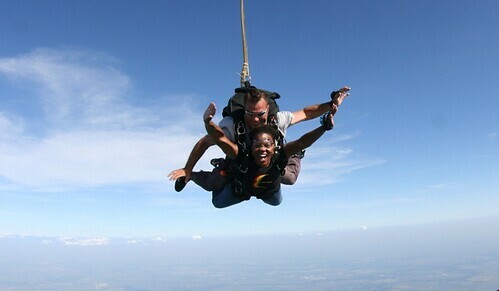 Not everyone should go skydiving, but whatever that challenge is for you, do it. I created a list of things I wanted to do by the time I turned 28. I didn’t accomplish all of them, but by having that list I was able to say “I accomplished some things,” and celebrate them, even though a lot of things were going on in other areas of my life. All the things that happened when I was 28 showed me that my identity doesn’t lie in where I live or what I do. I think the challenges highlighted how much I relied on those things, but also proved that I was more than those things. My identity doesn’t rely on having a job, living on my own, being independent, or being really smart. So, learn from the tumult. What’s the lesson it’s trying to teach? One lesson 28 taught me (and that 29 is now teaching me) is that I am lucky to be surrounded by such thoughtful people. Also, inspired by Celishia, I’m revisiting my “things to do by age 30” list. What should be on it? Leave a comment and let me know! Skydiving photo provided by Celishia. Want to read more? Click here to see the list of posts. This entry was posted in People, Projects and tagged 28 before 29, careers, counseling, home, saturn returns, skydiving. Bookmark the permalink. ← 28 for 29, #23: Annie L.